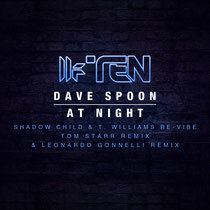 Toolroom Records culminate a massive ten-week campaign charting a decade’s worth of releases with The Anniversary Remixes of one of their most influential tracks, Dave Spoon’s ‘At Night’, which was a massive track for the label after its release in 2006. Featuring on two-dozen separate mix albums, the genre-bending ‘At Night’ epitomised the Toolroom sound of the time, merging elements of electro, house and tech to create a club favourite for many DJs and clubbers alike. Now, in reverence to the part the track has played in Toolroom’s history, it receives the remix treatment from Shadow Child and T. Williams, Tom Staar and Leonardo Gonnelli. This final anniversary release concludes a very credible series of remixes and releases that look back at an impressive catalogue of influential tracks that have been updated for today's dancefloors. It’s out now, have a listen below.